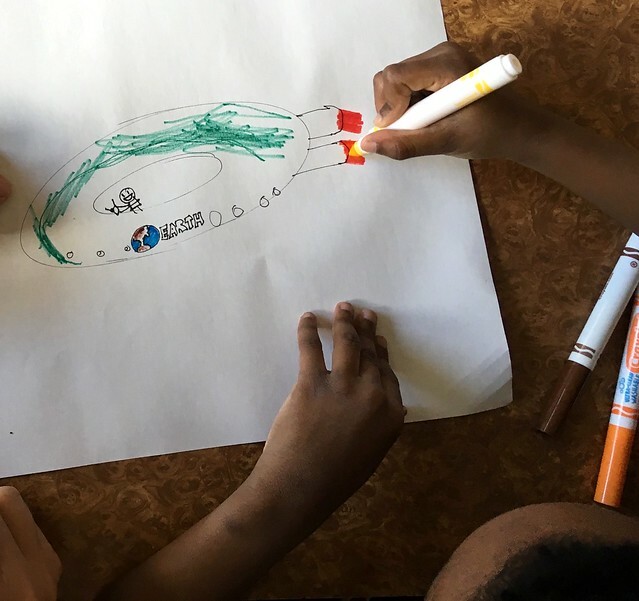 This time at New Alternatives for Children, we made “out of this world” artwork: the kids invented alien seahorses, basketball and soccer ball space people, fire breathing caterpillars, and then they designed their worlds and spaceships. One young artist, who particularly likes working with collage, decided to take his artwork into the thiiiiirrrrrd dimension and made a 3D diorama. Another kid asked us the very serious question of what would happen if aliens sucked out all of our brains and ate them for their dinner! We discussed the matter thoroughly but decided not to draw that one. We had so much fun, and everyone agreed we’d like to visit outer space again Thank you to our Event Director, Lisa LaBracio, for leading the night and to our superstar volunteers: Elana Amity, Stefano Imbert, Marty Macaluso, Abby Merrill, and Tim Savage, and most of all to the kids who bring fantastic energy and dedication to all our collaborations. We are grateful for such special moments, especially when they make drawings for us to keep too like the beautiful thank you card you’ll see in our pics!